Leave the canned jelly at the store. You deserve better! I’ve been watching those cheezy Loreal commercials my whole life. They’ve evolved, how women say the “I’m worth it,” line. Like we have to convince ourselves that we’re worth that $15 knockout hair color or that $10 never-come-off lip stain. And yet we do, right? We do have to convince ourselves that we’re worth the extra $5 or that 20 minutes for ourselves. OMG total zombie apocalypse if we take it! Cause that’s how long it takes to make it. 20 minutes. And if you can’t find 20 minutes to make an intensely flavorful, significantly more healthy cranberry sauce for you and your loved ones, it may be time to re-evaluate your schedule. Just sayin’. 4-6 ingredients, depending how you like it, and 20 minutes of your time. Done. 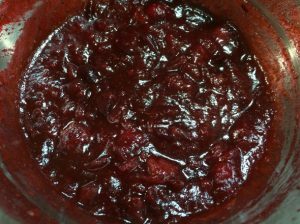 You control the ingredients, so no refined sugar here, which is usually the biggest offender in any store bought cranberry sauce. Plus, you can add whatever flavors you like. I chose nutmeg and orange zest and love it. Maybe you prefer cinnamon and nuts. As always, make it yours. Wash cranberries in fresh water. Remove any that don't float or look damaged. Combine cranberries, water, maple syrup, pinch of salt, and nutmeg (if using) in a medium size sauce pan over medium high heat and bring to a boil. Reduce heat to keep cranberries simmering/lightly boiling, for about 10 minutes, or until cranberries break down, forming a thick, rich compote. Stir often. Once you've reached compote stage, stir in orange zest and vanilla (if using). You can make this ahead of time and store in the fridge for 5-7 days. Other spices and flavorings you can use if you don't like nutmeg and/or orange zest: cinnamon, cardamom, ginger, cloves, lemon zest, crushed almonds or walnuts. What’s the Best Way to Wash Your Cranberries? Check out this Video on the Best Way to Wash Veggies – applies to fruits, too!